Robert Randolph & The Family Band first gained national attention with the release of the album Live at the Wetlands in 2002. The band followed with three studio recordings over the next eight years--Unclassified, Colorblind, and We Walk This Road--which, together with tireless touring and unforgettable performances at such festivals as Bonnaroo, Austin City Limits, and the New Orleans Jazz and Heritage Festival, won them an expanding and passionate fan base. Randolph's unprecedented prowess on his instrument garnered him a spot on Rolling Stone's "100 Greatest Guitarists of All Time" list, and also attracted the attention of such giants as Eric Clapton and Carlos Santana, who have collaborated with him on stage and in the studio. Just back from a string of dates in the southern U.S., we got to hang out with Robert in New Jersey last week where he checked out several BBE stomp boxes. 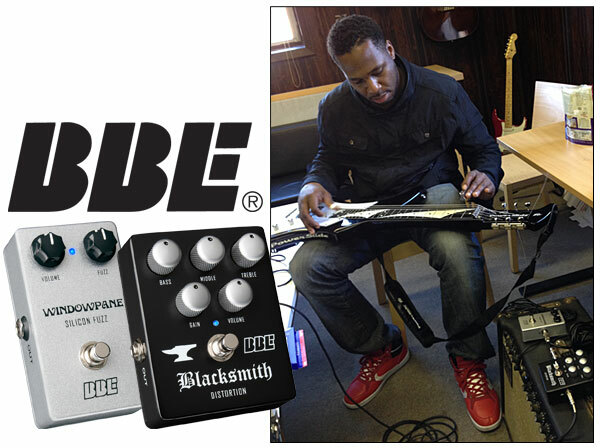 He particularly liked the BBE Windowpane™ Silicon Fuzz and Blacksmith Distortion and at the end of the day, Robert held up the Blacksmith™ and told us, "I love this pedal. That's the one for me!" Find out more about Robert Randolph at www.robertrandolph.net. About the BBE Windowpane™: Imagine a killer fuzz tone like Jimi at his best, with that creamy fuzz driving his Marshall into incredible sustain. For many fans, that tone is their holy grail. Unfortunately, the quest to find it is more like "chasing the dragon" because there's so much hype and misleading information out there. Windowpane cuts through that nonsense with experienced engineering for tone so authentic you'll swear the grail has landed on your pedal board. Windowpane's two sequentially-wired silicon transistors are properly biased at the factory and the tone is dialed in with a carefully selected treble roll-off on the second transistor, recalling the slightly mellowed top end of early germanium transistor fuzz pedals. But unlike those old classics, Windowpane fuzz pedals are remarkably consistent from one to the next, thanks to reliable, predictable silicon transistors and low-tolerance 1% metal-film resistors. Add in high-voltage poly caps on a rugged circuit board and Windowpane delivers the mind-altering fuzz tone you're after, gig after gig. And when you don't want to melt faces, a properly engineered true hardwire bypass means signal passes entirely around the circuit, from input jack to output jack without a hint of loading. Stop chasing the dragon and pick up a Windowpane, the experienced fuzz. Find out more here. Blacksmith is inspired by those pedals Gagon hand-made back in the '80s, delivering all the tone he brought to the rock gods but with greater consistency and durability. Blacksmith features 1% metal-film resistors, big fat signal traces on a mil-spec circuit board, true hardwire bypass to eliminate any pickup loading when disengaged, and a 1meg Ohm input resistance to welcome your axe’s signal with wide open arms -- just like the input on a killer Marshall. The Blacksmith isn't just for Marshalls, however. Gagon's design works beautifully with a variety of other quality tube amps, from Mesa to Fender. 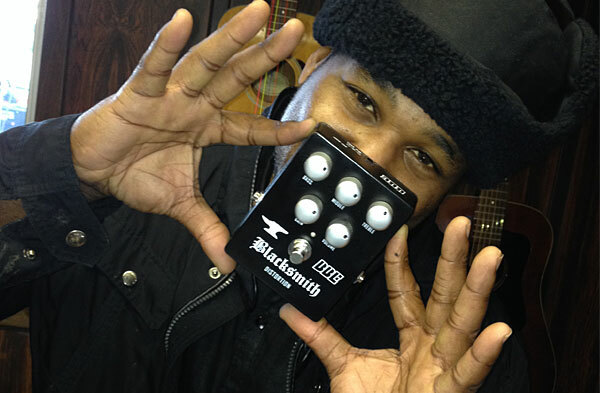 When you're looking for a top shelf distortion pedal that’s as musical as your amp, get your hands on a Blacksmith. Find out more here.